[fancy_link link="http://www.facebook.com/events/298878963466131/"]TYW Spain FB-page[/fancy_link] [teaser]The Official Yacht Week Party - Madrid [/teaser] [fancy_header]Party Time[/fancy_header] Dear friends! 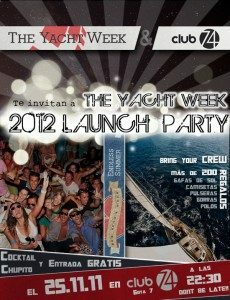 The Yacht Week & Club 74 crew are proud to present our exclusive Yacht Week 2012 launch party in Madrid on Friday the 25th of November. Join us in the best party of the year where you will experience the real TYW atmosphere, recall all those awesome moments in your boat and get to know everything about the event, the people, the boats and our destinations - including the new Turkey and Italy. Get to know everything you need asap because the boats will be available from 3rd December at 20h! Our invitation includes a welcome cocktail, a shot and - if you arrive early - a present from more than 200 hundred (sunglasses, polos, t-shirts, etc.) that we are giving away... so don´t be late! Moreover, and thanks to Club 74 we will enjoy happy hour in drinks and shots until 1am. We also have a super deal for table arrangements: 2 bottles for 160 eur, soft drinks included!